Just under two weeks after its figures showed that Chrome had overtaken Internet Explorer in terms of usage for the first full week, StatCounter now says that Google’s browser has seen its first full calendar month on top. 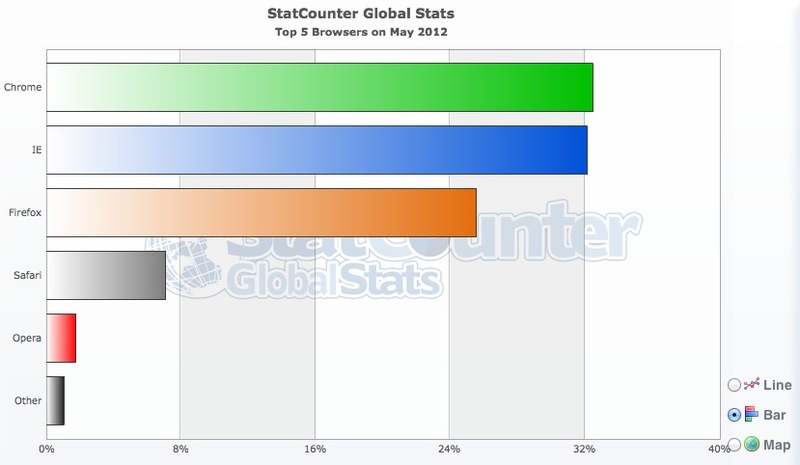 For the full month of May, StatCounter says that Chrome took 32.43% of the worldwide market compared to IE at 32.12% and Firefox on 25.55%. Additionally, in major markets like the US and UK, IE is still the dominant browser by some margin (38.5% share in the US, 36.84% in the UK). So, this is a slim victory, but a victory nevertheless, and one that marks another milestone in Chrome’s apparent continued growth to browser dominance. Or does it? StatCounter’s figures are based on data from over 15 billion page views to over 3 million sites that run the company’s stats package. While the firm says that it is not aware of any bigger comparable data sample, it’s still just a reflection of the visitors to sites that use StatCounter. Until rival sources of browser data also begin to note a Chrome dominance (they’re not yet), Larry Page should probably keep the champagne on ice.